To my immense relief, all apprehensions about the lack of solidarity within the Sindhi community, that I was initially led to believe existed, have proven to be unfounded. 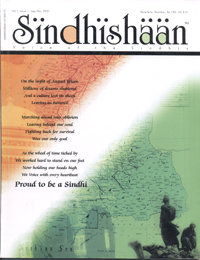 The positive and loving response to the inaugural issue of SINDHISHAAN from all over the globe has left me truly overwhelmed and deeply touched. I also had the good fortune of being invited to and attending the “Eight Annual Sindhi Sammelan” at Los Angeles, hosted by the Sindhi Association of Southern California between July 13 – 15 2001 and was amazed at the enthusiasm and keenness so obvious and evident amongst the Sindhi youth on the other side of the globe. The resolve of the SINDHISHAAN team is reinforced tenfold and there is confidence that – There certainly is Hope – There is definitely Light at the end of the tunnel. There is undoubtedly a slow but sure awakening of the dormant sense of belonging and the desire to know more about ourselves, and our rich heritage. We at Sindhishaan will continue to contribute to the best of our ability, towards assisting in achieving this objective. My grandfather, the late Principal N. B. Butani had on numerous occasions spoken to me about ‘SUFISM’ and tried to explain this mystical, yet simple ‘way of life’ philosophy which I was unable to fully comprehend as a young lad. Recently I chanced upon an article written by Late Prof. Ram Panjwani – “SUFI PRINCIPAL BUTANI”, which took me down memory lane and led me to delve into the essence of “Sufism”. The main feature of this issue has tried to deal with this subject in a simple and lucid manner and I sincerely hope and pray you enjoy reading it as much as we at Sindhishaan did while conceiving it. I conclude once again by thanking you for your good wishes and seek your continued blessings and support by way of suggestions, literary contributions, subscriptions, advertisements and sponsorships to sustain the revival effort.